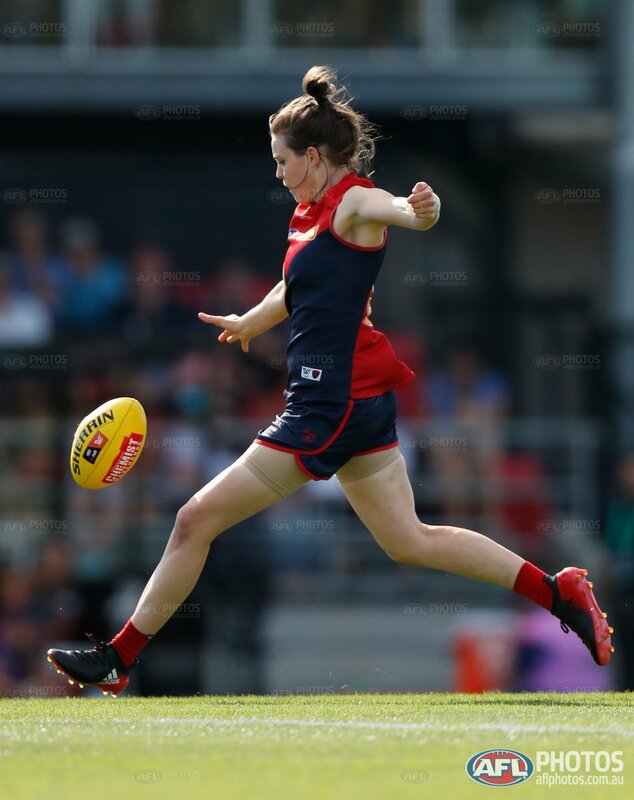 The Dees first goal of the match came after the Blues turned over the football from a kick out and Elise O’Dea intercepted the kick out and slotted through the goal on the run. They scored another goal this time once they won the football out of the centre and kicked it long into their forward 50 to a one on one to Tegan Cunningham who snap kicked the goal from about 10 metres from the goal square. Eden Zanker kicked nicely to her leading forward target in Tegan Cunningham who marked strongly in a one on one and from directly in front Cunningham booted through the goal. Cunningham from the boundary centre kicked to O’Dea who marked it and nailed through the goal. 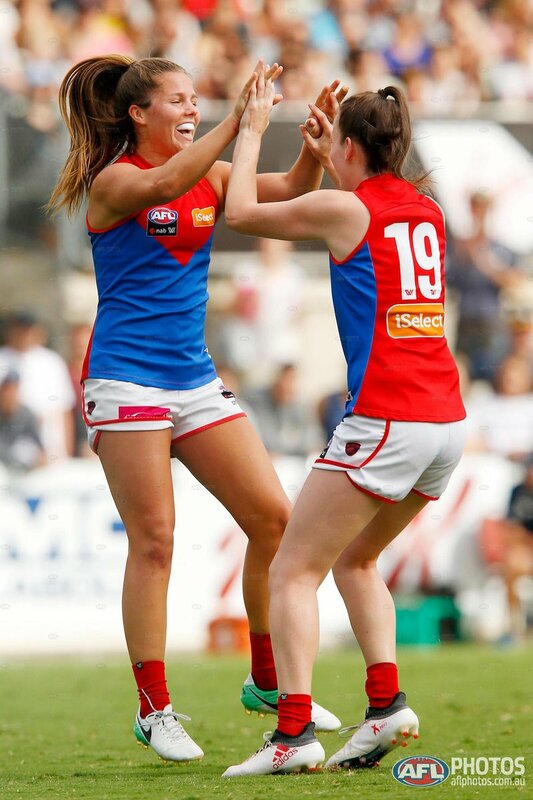 Jasmine Grierson showed poise to swing around on her preferred kicking foot to centre kick to O’Dea who marked in forward 50 and she gets her third goal in the first quarter. Cunningham was on fire in the opening term. Zanker placed a great run down tackle on Bridie Kennedy. Kate Hore from directly in front she slotted through the goal on the siren for the Dees. At quarter time the Dees had a 38-point advantage on the scoreboard over the Blues. In the second term, the Blues slowed up the Dees ball movement and made the game tighter after an open free flowing quarter in the opening quarter. New Carlton recruit Tayla Harris kicked a long bomb from inside 50 and nailed through the Blues first goal of the match in the opening minute of the term. Soon after Darcy Vescio scored the Blues second after the football spilt out the back and Vescio won the foot race and put through the goal on the run despite being under pressure. Cunningham caused headaches again up forward for the Blues defense, as the Blues gave away a holding free kick down in the goal square. Cunningham from directly in front slotted through her third goal of the match. The repeated inside 50s from the Dees put the Blues defenders under significant pressure. Late in the second quarter, 18-year-old Georgia Gee placed a goal saving tackle deep in defense. It was a cracking tackle! Cunningham’s continued repeated efforts up forward for the Dees in the second term were great to see. The Blues were down by 34 points at half time despite outscoring the Dees in the second term. It was a goalless third quarter from both teams with only four points scored for the entire term. With less than five and half minutes left in the term, it was sad to see Mel Hickey helped off the ground by the trainers and was reported that it could be a serious knee injury. The Blues defense were under siege late in the third quarter, but to the Blues credit their defense stood up well. At three quarter time the Dees held a 6-goal advantage over the Blues. In a quiet final term, the Blues had majority of the attacking play in the final stanza, but for all their effort they could only score one goal. Georgia Gee put through her first goal in her AFLW career after the football fell to the back and she crumbed and kicked it on the run. Gee was impressive in a bad loss for the Blues. Late in the last term, Alisha Newman hobbled from the ground. Shelley Scott kicked to Cunningham who marked strongly, but Cunningham did the team thing and kicked it to Kate Hore who booted through the Dees first goal of the second half. The Dees won by 35 points over the Blues who came at the Dees late in the final quarter and the Dees now sit second on the ladder with one round to go in the AFLW season. This AFLW season is going to have a cracking end next week with many teams in contention to make the top two and make the 2018 AFLW Grand Final.